As warmer temperatures begin to surface, pint-sized creatures swiftly seek shelter in cooler climates. And unfortunately, this could result in an infestation of your rental property. While you can eradicate the issue before prospective tenants occupy the premises, pests can resurface if the treatments aren’t recurring. TERMITES: Once termites discover the wood structures of your rental property, you’re in trouble. These insects feast on wood around the clock, and tenants may not be aware of an infestation until swarms begin to surface in the spring and a ton of damage has already been done. If you’re dealing with termites, a consistent approach is the best way to minimize serious property damage. 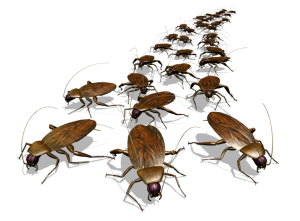 Once you get rid of the infestation, you need to set up ongoing treatments to keep them away, claims PestWorld.org. BEDBUGS: These tiny pests feed only on blood and can live for a year without eating, so your tenants could have a long-term infestation and not even know it. Bed bugs can bite and leave welts or a rash on many people, explains Bed-Bugs.com. RATS AND MICE: These small creatures should not be taken lightly. They have been known to spread diseases and present major safety hazards. Rats and mice use their sharp teeth to chew through brickwork, wiring and pipes, which is problematic for both the structure and plumbing of your property. And, should they decide to chew on the wires of your rental property, they could start a fire. VERMIN: Like rats and mice, vermin take a liking to wires and pipes. Depending on the extent of the chewing, your rental property could burn to the ground as a result of an electrical fire. And, leaky pipes could lead to water damage or even flooding in severe cases. If an infestation makes the living space inhabitable, you run the risk of your tenants refusing to remit payment and relocating elsewhere until the pests are eradicated. In some instances, they may completely abandon their lease, leaving you with a shortage of rental income, structural damage and a hefty pest control bill. Ensure screens, exhaust vents and chimneys are free of tears or other defects.